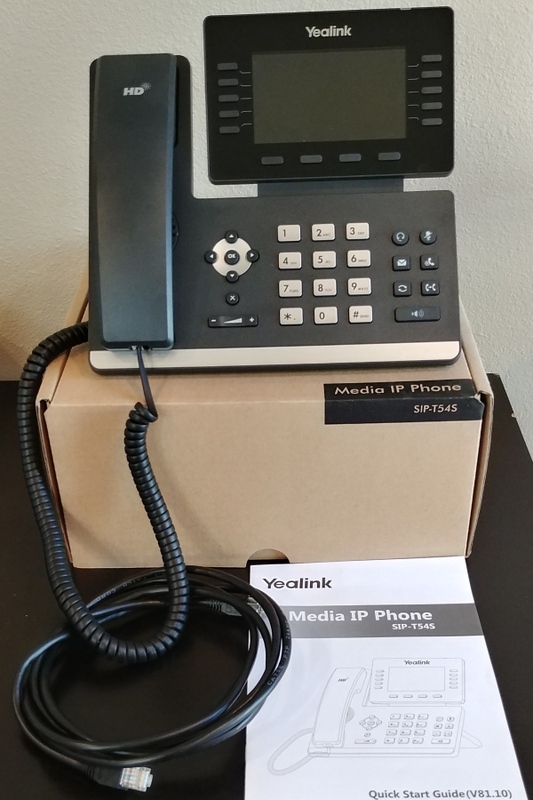 The Yealink T54S and the T52S are part of the latest set of Media IP Phones released in North America by Yealink. The T5 series includes the latest heads up display design providing an easy to view tilted display, as well as Gigabit Ethernet, high definition audio, and built-in Bluetooth. The silver accents on black makes for a very stylish and modern looking design. We also take a look at the EXP50 expansion module that is specific to the T5 series phones. 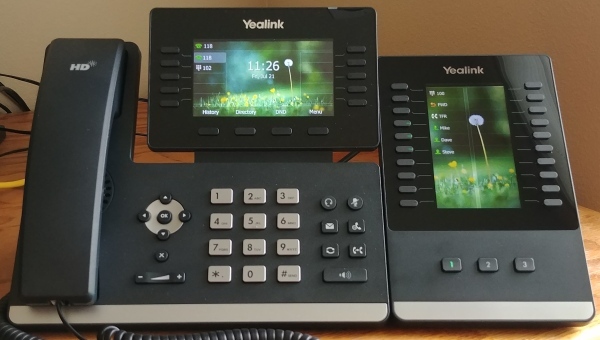 The Yealink SIP-T52S and the SIP-T54S phones are very similar in design and specifications. The T52S is a lower cost model, with the main difference being a smaller 2.8 inch 320x240 pixel color display. 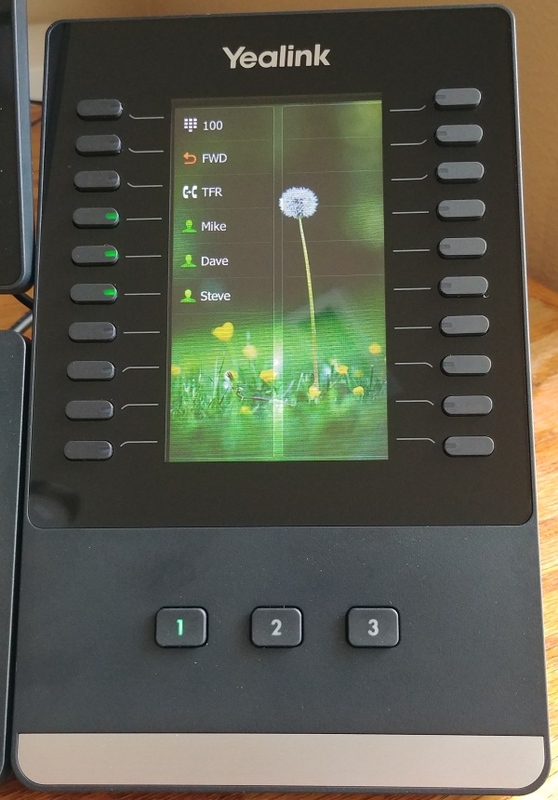 This review focuses on the Yealink SIP-T54S phone and also includes technical specifications, links to helpful documents and user reviews. We also test out the EXP50 expansion module that attaches to the T5 series phones. The T54S is a very stylish and modern looking phone. The silver keys stand out well in contrast to the black phone body. The silver accents and keys on black provide the style and a familiar feel to the T4 series phones. The main design change that stands out is the tilted forward heads-up style display. This provides a modern, almost futuristic look while also making a lot of sense for easy viewing and usage. Sometimes the simple tweaks can make a big difference. The angle of the phone has been increased slightly also making it feel more aligned with a users viewing angle when looking towards the desk and it actually helps to reduce the overall footprint, saving a bit of space on your desk in the process. Even the handset has undergone some slight design changes, adding to the sleek style and it feels very comfortable to use. The display is a large 4.3" 480 x 272 pixel backlit 16-bit depth color LCD. It comes with a default wallpaper setting plus 10 other options that can be set from the web portal or directly through the phone's menu. You can also upload your own wallpaper through the phone web portal access (Settings->Preference). The display is a nice size, provides vibrant colors, and makes navigating the menus easy. The T54S does not only look modern but it comes packed with modern technology like dual-port Gigabit Ethernet connections, built-in Bluetooth 2.1 for wireless headset connection, a USB 2.0 port, OPUS audio codec support (for improved audio quality, but check that your service provider supports it), PoE support and can handle up to 16 VoIP accounts. The USB 2.0 port can be used for adding WiFi capability via the WF40 dongle (optional add-on), provide call recording to a USB flash drive, provide direct connection for wired/wireless USB headsets, and can provide connection for up to three (3) EXP50 expansion modules (optional add-on), see below for more information on this module. There are ten (10) DSS keys that can be programmed in various ways including BLF, speed dial, call park and more. Each key has a built in LED providing both green and red indications for available/busy functionality. The display allows up to three (3) pages of keys, equaling a total of 27 programmable features. These keys can be set up through the online portal, via the phone itself (Menu->Features->DSS Keys), or via your service providers auto-provisioning (ask your provider). 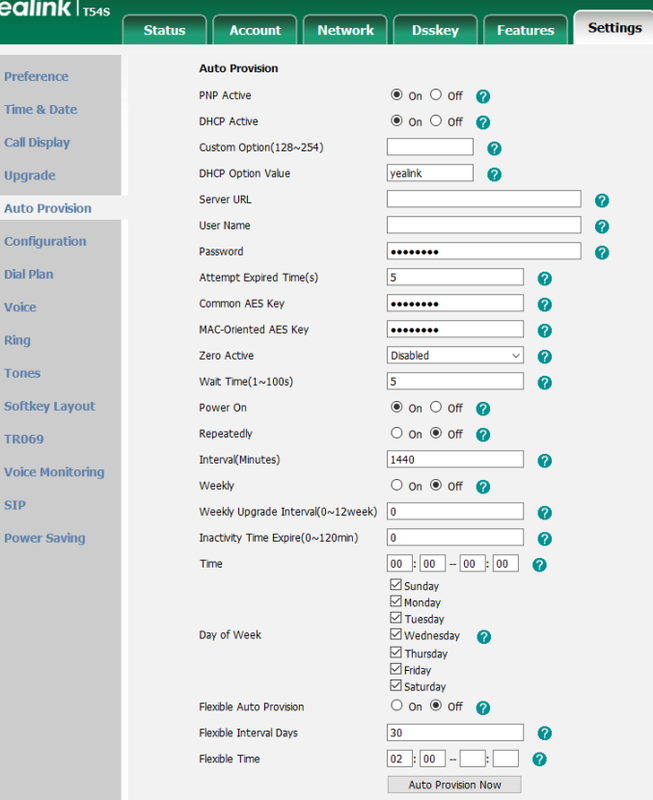 There are also fixed feature keys specifically for headset, mute, voicemail access, hold, transfer, redial and speakerphone. The speakerphone, mute and headset keys illuminate to help indicate they have been pressed and in use. The audio quality for both the handset and the speakerphone is excellent, as we have come to expect from Yealink. The handset audio is particularly good when on a VoIP call, crystal clear and in high definition. The microphone used for speakerphone mode has been moved up to the top of the display providing great voice pickup. You can easily be sitting 3+ feet away and the pickup is excellent. No more leaning into your desk phone when talking in speakerphone mode! There is ample volume range for both the speakerphone and handset usage. We found the mid volume range to be more than enough for a small office. The option to use the Opus codec will also improve the audio quality, even under poor network speeds. The handset is also Hearing Aid Compatible (HAC). The EXP50 expansion module is an optional add-on that includes a large 4.3 inch 272x480 pixel color LCD display with 20 DSS keys providing the capability for up to 60 programmable features across three (3) screen pages (20 per screen page). Each key includes dual-color LEDs (red and green) providing available/busy indications when used for BLF functionality. The EXP50 is designed specifically for the T5 series phones, with up to three (3) modules being supported by a single phone. The expansion modules easily click together with an included plastic connector, and electrically connect using a supplied USB cable. Keys are easily programmed by pressing and holding it down for 5 seconds. You can then assign the DSS key feature using the IP phone display and keys. Some examples of frequently used features that can be assigned include Conference, Forward, Transfer, Hold, DND, Recall, SMS, Direct Pickup, Group Pickup, Call Park, Voicemail, Speed Dial, Intercom, Line, BLF and Group Listening. You can set the wallpaper background of the module display through the IP Phone menus (Menu->Basic->Display->EXP Wallpaper). This module is a great additional option for people in receptionist and adminstrative assistant roles, providing the ability to monitor many contacts and manage large call volumes. Figure 1 below provides a close up picture of a working EXP50 module. Like many IP phones, it comes without a power supply. Power supplies are low cost and it always feels like they should just include one. Just remember to order them separately if you need them (i.e. if you do not have PoE capabilities in your setup). We love the new heads up display design but it almost feels like it should be adjustable (back and forth). I bet a few people will try to adjust it just based on the way the design looks (it is only attached to the phone body along the bottom edge of the display). We think it would be neat if it was adjustable, even if only a few discrete notches of adjustment. The user could then adjust based on their viewing angle (seat height, desk height, users posture etc.). However, there are two discrete settings on the phone stand which can be used to change the angle of the phone which helps. There is only one (1) USB port so if you decide to use it to connect a WiFi WF40 module then you cannot make use of the other USB features like call recording to a USB thumb drive. The EXP50 expansion modules do have a USB port so it may be possible to use that for other features like call recording and adding WiFi capability. This is more of a personal preference but the "menu" soft key is on the right side of the phone display and the arrow keys are on the left side of the phone. It just feels disconnected and cumbersome. You can reprogram the soft keys so that menu is on the left side, but I always wonder if there should be a specific "Menu" button above the navigation buttons as it is an important function. New heads-up display design provides not only a stylish look but a more natural viewing angle for the user. Packed with technology such as HD audio, built-in Bluetooth 2.1, Gigabit Ethernet, USB 2.0 port, Opus Codec support and 16 VoIP accounts. Vivid 4.3 inch 480x272 pixel color display with backlight. Supports up to three (3) EXP50 expansion modules (around $120 per module), providing up to 180 additional programmable keys. Priced in the $199.99 range and aimed at high-end office users. 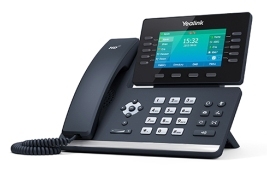 The Yealink SIP-T54S is a very eye catching, stylish, and modern looking media IP phone. It is part of the new T5 series phones released by Yealink with a redesigned heads-up style display for improved viewing angle. It includes Gigabit Ethernet, built-in Bluetooth 2.1, HD audio, Opus code support, and a USB 2.0 port all built into a compact footprint design. This phone is aimed at high-end office users but would be appreciated by everyone. Setting up the phone is very straight forward. You simply connect the stand to the body, connect the handset to the body with the included cord, plug the Ethernet cable into your Internet connection, and then connect the power supply (if not using PoE). The phone will power up and say "Obtaining an IP Address" on the display. Once this is complete you can provision the phone. The phone can be provisioned in multiple ways, including through the phone menu, through the web access portal, or through auto-provisioning. The following focuses on provisioning through the phone's web portal access and auto-provisioning. Using a computer/laptop device connected to the same internal network as the T54S phone, open up your favorite web browser. Press the "OK" button on the phone to find out what the IP address is. Then type the IP address into the web browser address bar and hit enter. 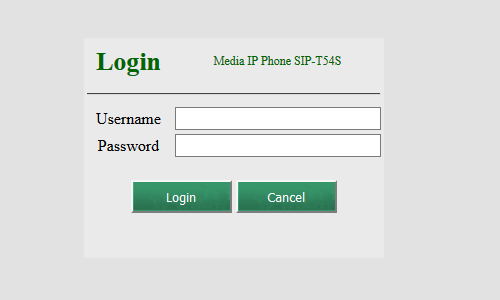 You will then be connected to the IP phone and will see the standard Yealink login screen, as shown in Figure 4 below. The default username and password is "admin". Type these in the appropriate boxes and click on the "Login" button. 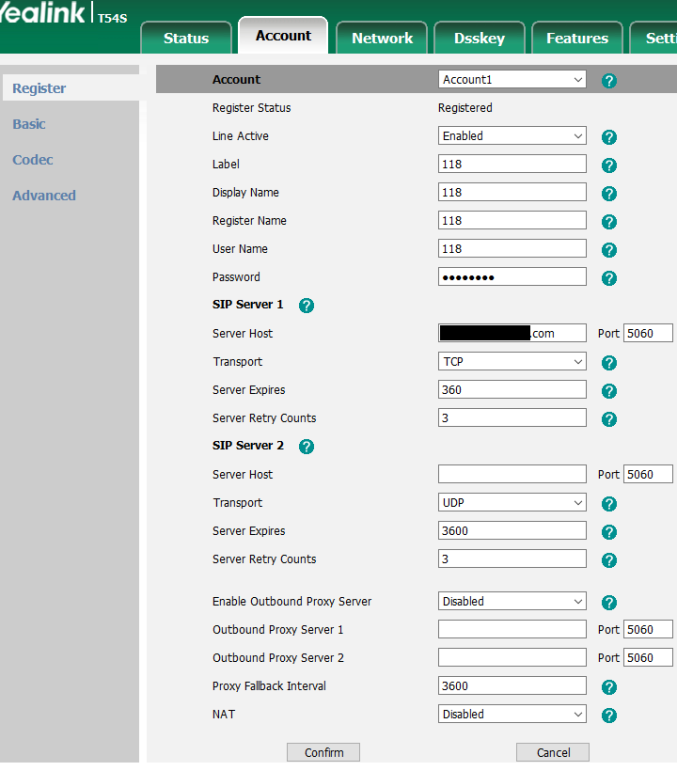 Once sucessfully logged in click on the "Accounts" tab and you will see the "Register" page as shown in Figure 5 below. Select "Account1" for the "Account" field to start. Label - This is the name that will appear on your phone display for Account1 line. SIP Server 1 - Complete the following fields. Server Host - this is the SIP server domain name or IP address for this account. You can also set the Port number. Transport - set this according to your provider transport protocol settings. SIP Server 2 - Redundant server. These fields are not required to be completed. Once you have completed the approriate fields click on the "Confirm" button at the bottom left and the phone should register with you PBX. If you purchase your IP phone through your service provider they will typically send it to you already set up for auto-provisioing so you just need to plug the phone in and away you go. If you need to do it yourself then your service provider can provide the exact details but here is the basic setup required. Navigate to the "Settings" tab inside the web portal. On the left side navigation menu click on "Auto Provision" and you will see the setup screen as shown in Figure 6 below. Server URL - enter the provisioning server URL here. User Name - enter the provisioning user name here. Password - enter the authentication password for the provisioning server here. Once you have completed the appropriate fields click on the "Confirm" button in the lower left area of the page. The phone may restart. Once the confirm is complete click on the "Auto Provision Now" button. The phone should register if all the settings have been entered correctly. Whichever way you decide to provision your phone it should be ready for use as soon as it has registered to your PBX. There are many more settings that you can play with so check out the tab for more resources to learn more. Happy calling! We're sorry, there are currently no user submitted reviews for Yealink T54S matching your search criteria at this time. Please add your own review or check back later as reviews are being submitted often.